Did you know that 80% of New Year's Resolutions fail by February? Why? Because, they tend to be too abstract. It's great to set ambitious goals, but you need to define concrete steps to reach them. This edition of LibGuides Tips & Tricks focuses on some of your 2019 goals by breaking them down into achievable tasks, and connecting those tasks with LibGuides tips. Start the New Year off by setting yourself, and the library, up for success. Not surprisingly, getting organized is in the top 10 of traditional New Year's Resolutions. Most people approach resolutions for the New Year as a 'reset' button. But rather than approaching clutter, real or virtual, as something to abolish in the new year - instead approach it with a mindset geared toward realistic expectations, positive outcomes, and reward for hard work. You know that drawer in your home that becomes the catch-all for dead batteries, orphaned buttons, restaurant menus, and random slips of paper? Well, your computer and cloud-based storage apps can morph into that junk drawer - becoming your storage repo for old documents, outdated bookmarked websites, and other 'virtual' junk. Start by Purging - You don't need to wait till January 1 for your resolution to kick in. Take a day, or maybe 2, and go through you entire computer and all your virtual storage spaces (including LibGuides), and do a purge. Set Up Regular Maintenance - Staying organized is not a one-and-done effort. It requires steady work and maintenance. Create a recurring reminder in your calendar every month to go through your recently added items and purge them where needed. Staff changes leave your LibGuides > Accounts table peppered with accounts for people who don't work at your library anymore. Perhaps they retired or moved to another institution - either way, they no longer work there and shouldn't have a login. Discuss Ownership vs. Credit - Before you start deleting accounts left and right, it's good to start with an internal discussion/policy on ownership versus credit. At most institutions, it is the institution that owns the content. (Check your local policies to determine content ownership for your institution. This is not something Springshare can determine.) But you may decide that just because Librarian Sally Smith left the library, her content shouldn't be reassigned to another owner without attribution (credit). Pro-Tip: Create an attribution box that shares information on the original author. Reassign Ownership - In the prompt > reassign guides to a new owner. Pro-Tip: Don't want to reassign all guides to one new owner? Before removing the account, manage ownership for each guide individually via Content > Guides > icon. Not surprisingly, the most common New Year's Resolution relates to fitness and health, according to a 2015 Nielsen Survey. Whether it's eating healthier, or improving overall fitness - this ambitious goal is usually #1 on resolution lists and often the first abandoned by February. Now, you might be asking yourself, how can LibGuides help me achieve this goal? According to research done by the American Psychological Association, social support can help you achieve this ambitious goal. And if your company or institution takes part in Employee Wellness programs or challenges, you have a built-in social support network right at work... the place you spend 40+ hours a week of your time. Need suggestions for varying your workout routine? What about recipe ideas for cooking heart-healthy salmon? Music suggestions for your daily meditation? 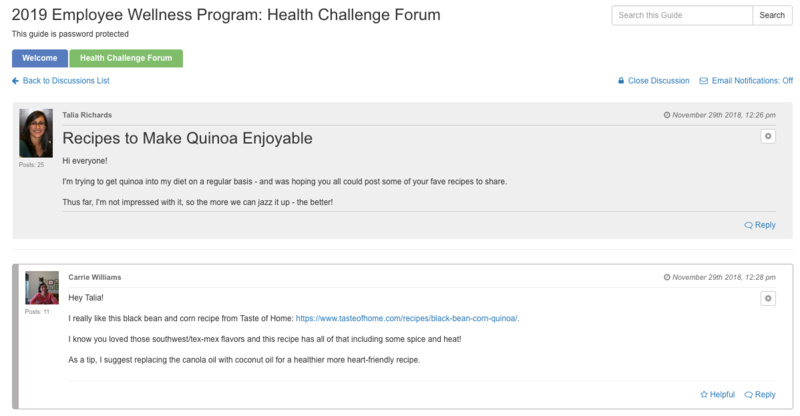 Create an internal or password-protected LibGuide for your staff wellness program with a private discussion board so staff can share ideas, crowd source tips, and provide social support to those participating. All communication is internal/private - don't worry about your patrons viewing it. Email notifications - receive alerts every time a new reply is submitted. Archivable - Email was never meant to be an archive. Discussion boards are archivable and organizable via tags. Resolutions don't always have to be about changing behaviors - they can focus on 'adding' versus 'subtracting'. Like learning a new skill or hobby. Unfortunately, these resolutions are often the first to be abandoned because they tend to be more time-consuming than initially thought. To ensure your goal of learning something new doesn't fall by the wayside, be sure to break it down into realistic action plans with multiple steps and check-in points. This way, you can monitor your progress and check off small accomplishments on your journey. Did you know that LibGuides is built on the Bootstrap 3.3.7 framework? And with that underlying framework, comes preloaded styling and mobile-first design for things like buttons, tables, and other design elements? Well, it does! And, if you don't utilize them fully - well that's like driving 20mph on the highway in a Lamborghini. You have all this power under your LibGuides hood - use it! Beef Up Your HTML/CSS Skills - If you haven't been keeping up-to-date, HTML5 is the latest version. It's always a good idea to refresh your base skills before learning a new one. Springy Insider Info: Mozilla Developer Network has great and free tutorials on HTML5/CSS. Learn Bootstrap First - If your HTML/CSS skills are medium-to-proficient, then you're ready to start learning bootstrap. There are tons of great online tools (see the sidebar! ); check with your library's subscriptions to see if they provide access to any of these tools. Below is a mix of free and subscription-based resources. TutorialRepublic.com - Free overview tutorials. LibGuides Tip: Apply Those Bootstrap Skills! 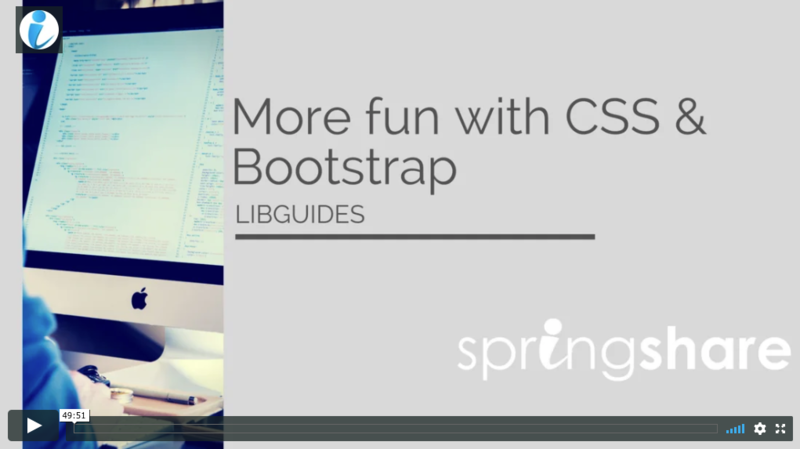 Watch Springy Training - If you're well-versed on Bootstrap and want to put those newly-added skills to work, watch our CSS & Bootstrap for LibGuides training webinar. See What Others Are Doing - Mosey on over to the SpringshareLounge.com to see what others are doing and ask for help and ideas from your fellow librarians. 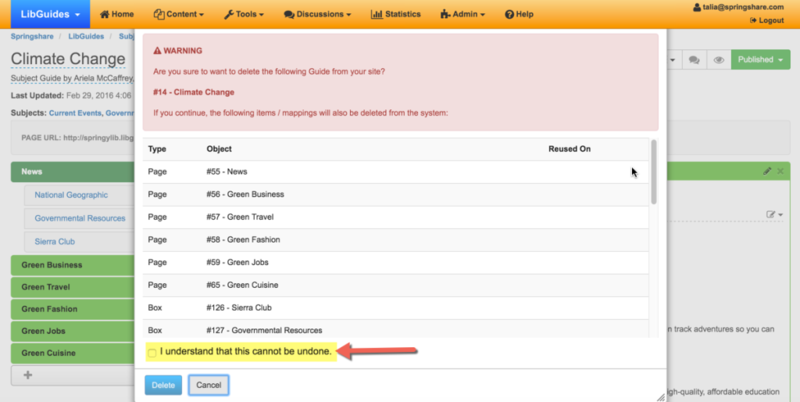 LibGuides CMS Users - Create a Sandbox - Don't want to test out your cool customizations on a production site? If you're a LibGuides CMS subscriber, create an internal group as a sandbox site. Whether it's sending regular letters or emails to distant loved ones or remembering to put events on your family schedule, improving communication is usually at the top of people's resolution lists. Communicating effectively with colleagues doesn't only mean writing shorter 'to-the-point' emails or reducing five meetings down to just one. It also means ensuring that your digital footprint is communicating effectively as well. In shared environments, like a network drive or within LibGuides, it's easy to forget that other people have access to that space. So naming a file first.doc or an important PowerPoint as draft.ppt doesn't help anyone. They won't know what it is and in 6 months...neither will you. Communicating effectively with colleagues can be as simple as naming and organizing your file assets... including LibGuides. This tip works for both admin and regular level user accounts. One of the greatest and most powerful features of LibGuides is its reusability. Create it once, whether it's a page, a box, or an asset, and reuse it everywhere. Nothing makes this powerful feature more unusable than not giving it your widget asset a name. Naming your widgets properly allows your colleagues to find and reuse your widgets effectively. Plus, it makes long-term maintenance easier! Rather than having 10 individual search box widgets, have one widget that is reused 10 times. If you ever have to update that widget, you'd update it in one place vs. ten. If your widget asset doesn't have a name, or a descriptive one at that, then it becomes invisible when you search for it for reuse. And if you don't know what that widget is, whether it's a YouTube video or Database search box, you won't be able to decipher it via the code. Around the holidays, our stress levels tend to be in overdrive. And then around the start of the new year, we turn our attentions to ways we can improve our lives by reducing stress. This can range from getting 8-hours of sleep at night, adding daily mediation to your routine, to not sweating the small stuff. A great way to reduce stress is to (as the Boy Scouts say) be prepared. There's also the proverb "an ounce of prevention is worth a pound of cure." However you want to look at it, having a plan or routine when making changes can save a lot of stress! This tip covers a couple of different scenarios, both focused on what you can do to minimize stress relating to loss of content...whether that loss is related to guide overhauls or guide deletion. Either way, HTML Guide Backups are there to save the day! If you're planning on making any large changes to your guide, make it a habit to have your first step be making an HTML Guide Backup! This simple initial step can save you a lot of stress and heartache later, if you decide that your restructuring idea didn't work out as you'd hoped or if you removed some content and later want it back. While it won't automatically restore your content, it will give you that all-important blueprint to use to recreate it! It happens – you’re deleting old/unused guides and you accidentally delete a current guide by mistake. All that content…just gone. Well, no worries, LibGuides automagically stores HTML backups of all deleted LibGuides. When deleting a guide, there is a prompt that shows you what will be deleted, the impact it has on other guides, and a confirmation requirement to triple-check that you really really really want to delete that guide. In fact, you won’t even be able to delete your guide till that checkbox is firmly, and decisively, checked. Every time you delete a guide, we automatically generate an HTML backup. Download the HTML backup and use it as your guide (pun not intended) for recreating that deleted LibGuide. This way, you’re never starting from scratch with a blank slate. The Guide HTML page is your ‘mission control’ for all guide backups. So, if you’re regularly backing-up your guides (Guide > Create HTML Backup), all of those backups will display here. If you've deleted a guide, the automatically created HTML Backup will also display here, along with who deleted it and when. If you backup the same guide two or more times, you’ll be able to see all backups for that guide and download whichever one you’d like. Use the checkbox at the top of the screen to display all available backups, and not just the most recent one. To download Guide HTML backups, go to Tools > Data Exports > Guide HTML > locate your guide in the table and select . In the ‘Deleted’ column, you’ll see the exact date & time the guide was deleted. The HTML backup will contain the content as of when the guide was deleted. Retrieve backups of deleted guides as far back as December, 2015. Once you have your backup, you can open the file and use it as a guide to recreate content...or even just to remind yourself of the layout of the guide at the time. Remember, also, that deleting Assets (like links, Databases, books, and widgets) does not delete them entirely from the system. It simply removes the association (or mapping) from that guide/page. If/when you need to recreate content, simply reuse those existing Assets, saving yourself some valuable time. If you need to recreate Rich Text content, feel free to copy / paste content from the backup, but remember to use the Paste As Plain Text option (see the Caution box in that FAQ) to minimize any issues related to formatting.